I was smitten by the reviews of another group member and wanted to get back to the Dismas Hardy books. I’m reading them in order but it’s taking a long time – so far it’s been #s 1-4 plus one in the middle somewhere (my starter). This is #5 out of 13 so far. Dismas Hardy, the protagonist of the series, is a San Francisco based cop-turned-bar-tender-turned-lawyer whose best friend, Abe Glitsky, is still with the police force. 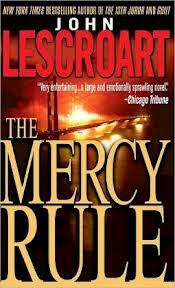 In The Mercy Rule, Graham Russo, a former baseball star but also a lawyer, turns to Hardy for help when he is suspected of murdering his very ill and Alzheimer stricken father, Sal Russo, who really, perhaps, committed suicide or else, really, was murdered by … um … was it a mercy killing or a planned murder or a robbery-murder? Could be anything and how far was Graham involved? He’d said he’d help his father in a suicide. But helping with a suicide would likely not get a guilty verdict in San Francisco – and the idea of mercy killing is a huge theme. But Russo has enemies in San Francisco and the police force and DA are not always on the up-and-up. Meanwhile, one of the investigating officers has fallen in love with Russo and it looks like it’s mutual – or is it a game for one – or both – to get an inside track? There are several threads in this book – first there’s the problem of Graham Russo’s guilt or innocence – that takes the reader through a trip to court. Then there’s the problem of mercy killing and the issue of if not Graham and if it was a murder, who done it and why. I think the handling of all these threads proved a bit too much for Lescroart but the book needed all three – 2 for the mercy killing aspect and one for the who-done-it and action.